Italian home décor becomes more and more popular because of its simplicity especially when it is combined with your modern lifestyle. Furthermore there is luxury feeling that you get from this design when you apply it inside your house since the design is very elegant even though it is casual looking. The accessories used in this design are dramatic so it could support the glamorous architecture that Tuscan house has. This is why a lot of people try to take the inspiration from Italian home and used it to create their own sanctuary inside their house. Let us learn more to use this inspiration to decorate your house with more luxurious feeling but in simple things. If you want to use chandelier inside your house, then you should do what the Italian do, which is to go with grand chandelier. Italian chandelier with two tiers will look majestic inside your room. This Italian home décor also makes your room look more luxurious and add more warm feeling with the lights. You can try to put the chandelier in the middle of your house hall or in any room that you want. However you need to make sure that the size of the chandelier is suitable for the room since chandelier with two tiers tends to be big in size thus it might suits bigger room, but you can try to find smaller chandelier instead. Detail is important in Italian home décor, which is why you must try to use travertine as it is a traditional material used by Italian. Nowadays the material also used not only in Italian home design but also in modern home because of the luxurious feeling that it brings. That is why you should also try to use it in your Italian house to bring the luxury feeling inside. You can use it for wall, ceiling or flooring since the material could be used for everything. If you think that using it is too much or you think it’s rather pricy, then you can use it for countertop of your kitchen or dining table. There is some furniture that has travertine detail so it is easy to get one. Another important material in Italian home décor is wood since it could create warm feeling that the Italian loves. Most of the time, the house really have some wooden structure especially on the ceiling beam. However if you live in more modern house of course you cannot have that kind of Italian house structure. But you can still have wood in your design by using it on the furniture and accessories all around the house. Try to find Italian wooden bed frame which very grand and beautiful to have for your bedroom. You can also try to have wooden coffee table in your living room if you do not want to use wooden sofa. Italian wooden furniture usually has beautiful craft detail which makes it look luxurious. If you want to get more comfort to your room, then you must try to use Italian home décor rug. Their rug has magnificent detail which makes them appear more luxurious. Furthermore you will also feel more comfortable when you step on them. Try to put the rug in your bedroom and living room to add the luxury appearance. It also function as area divider if you have open house layout thus make it really useful. If you have extra budget then you can also try to put carpet along the hall to add the luxury. For other Italian home décor detail, you can try to use more earth tone for its color. As you know Italian love to have warm house, and those earth color will make it happen. Try to use items with terra cotta, golden yellow, as well as green to give fresher atmosphere to the room. You will see that those color combination will really make the room appear more warm and luxurious. 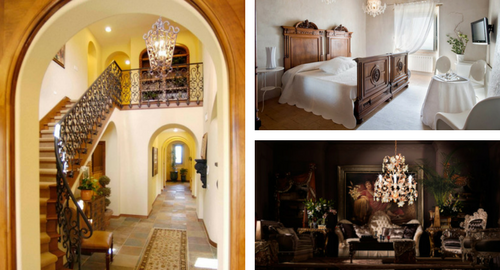 If you want to use Italian home design, then you must remember to use more natural material and color. Since Italian loves natural things inside their house, then the material and color used in your design should reflect it too. You might feel that Italian design will make your room look old, but actually you can try to combine Italian home décor with more modern house to make it trendier but still following the tradition. This mixture will create modern Italian design but with traditional design. Still you need to use more elegant detail since Italian house is known for their luxurious appearance. Of course making yourself feel comfortable also needed since the house will become your sanctuary after a long day of work.